This property offers subsidy through the HUD Project-based Section 8 Program. Residents pay 30% of their income for rent. There is one market rate 4 bedroom 2 bath unit located on the property. 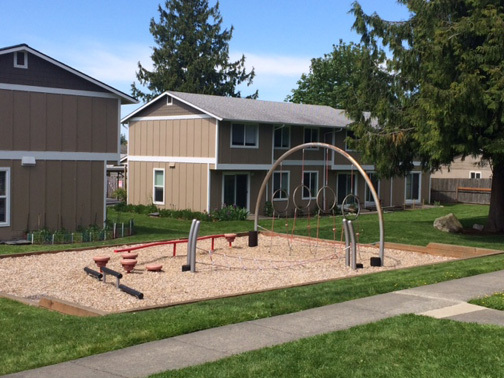 This property is conveniently located across the street from Skagit Valley College. On bus line. Close to shopping, restaurants, entertainment, schools. Walking trails and playfield across the street from college. Spacious townhouse style apartments with convenient laundry facilities on site. Cable TV ready. 1, 2, 3 and 4 bedroom apartment. Quiet neighborhood. Below Very Low HUD limits with preference for extremely very low. This property offers subsidy through the HUD Project-based Section 8 Program. Residents pay 30% of their income for rent. There is one 4 bedroom apartment that is unsubsidized and rents for $889 per month, Housing Choice Section 8 Voucher accepted for this apartment.